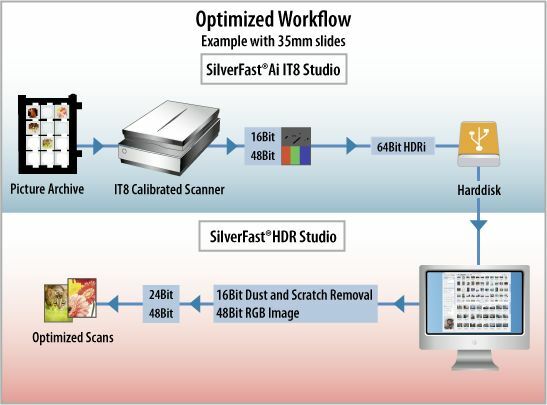 NEW: The SilverFast 64bit HDRi Raw data format is now available for EPSON scanners! LaserSoft Imaging has developed the 64bit HDRi RAW data format and is now providing support for the first EPSON scanner models. After scanning your slides or negatives in RAW data mode save them unprocessed to your hard disk. This is a quick and easy task even with larger collections. These RAW data files contain the entire image data including the infrared channel’s data and therewith any information the scanner is able to read. You can post process the images to your needs at any time later and this for multiple times, because the RAW data archive remains unaffected in the process. This workflow including a color management system is featured by our SilverFast Archive Suite software packages.